Big Charlie is arguably one of the best bonefishing guides in the world, specializing in hunting double-digit trophy bonefish. He’s even guided other guides, like “Crazy” Charlie Smith’s son, Andy, in the cult classic In Search of A Rising Tide, one of the best bonefish-on-fly films ever made. If I had one day left to fish it would be with Big Charlie in Andros. Fatiha has a way of bringing a uniquely personal touch to the fishing lodge experience. She is the founder and developer of Big Charlie & Fatiha’s Bonefishing Lodge. Originally from Morocco with a degree in Hotel Hospitality she can converse in 5 languages. There are no “stock” trips here! Every detail is considered. Fatiha acts as liaison for guests regarding transportation to and from the airport and confirmation of local flights. Having an intimate knowledge of Andros culture helps her run a smooth operation from touch-down to take-off for every guest. Fatiha’s knowledge in guest services includes fine foods and wine. 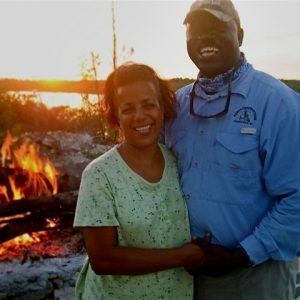 She’s in charge of the lodge’s famous cuisine, and under her watchful eye the kitchen staff prepares some of the most delicious meals found at any fishing lodge in the Bahamas. Fatiha also handles any special needs guests might have—food alergies, etc.—and her personal touch makes the lodge feel like home. Big Charlie’s caters to serious anglers who want world class bonefishing, great food and comfort. 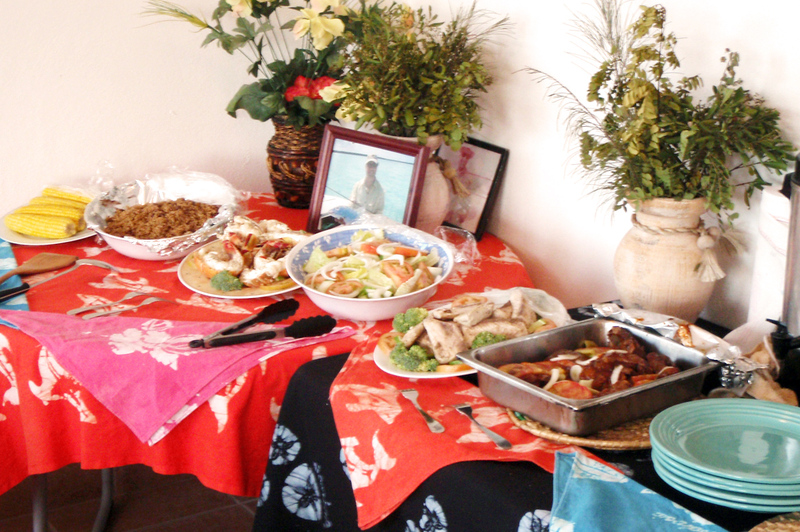 We can accommodate up to 8 anglers per week, but that can still make for a pretty lively party. Our back patio looks out over Cargill Creek and sports Charlie’s famous barbecue grill where we host farewell dinners or gather around the fire telling fish stories and enjoying the Bahamian breeze. There’s also a newly constructed Tiki Bar and barbecue on the beach. 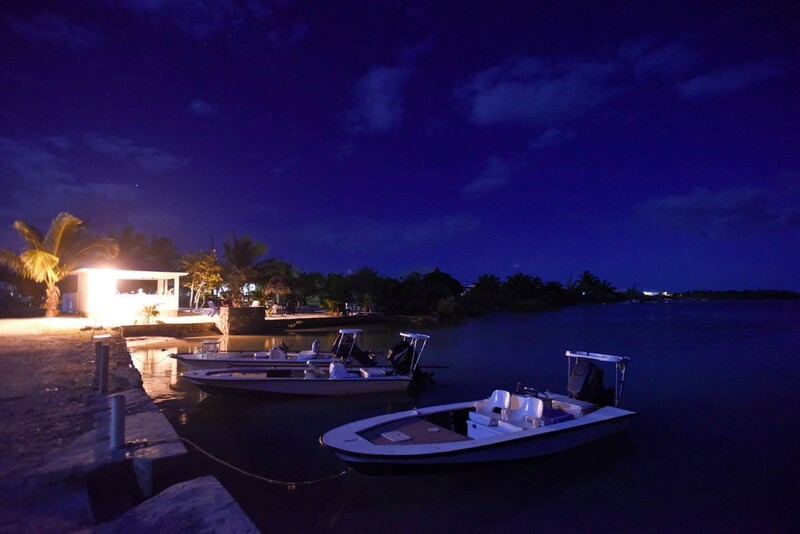 After dark step out on our private dock and take in the endless night sky, free of city lights. 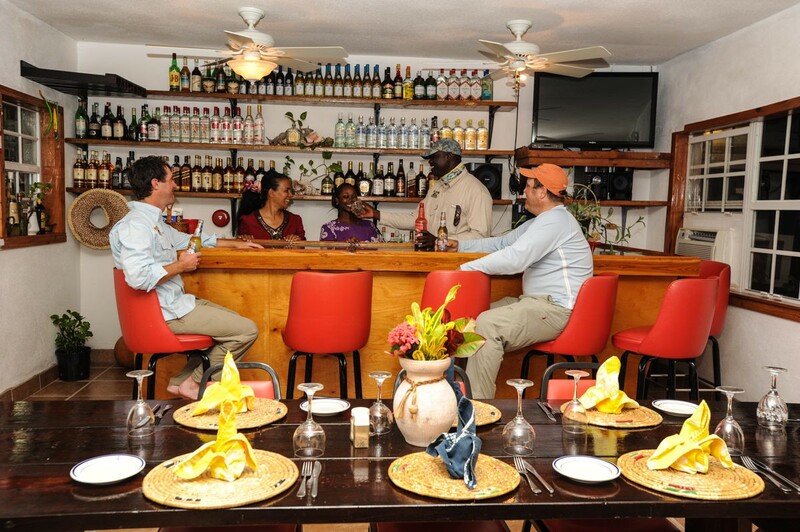 Our air-conditioned lounge and dining room is where we serve our meals. 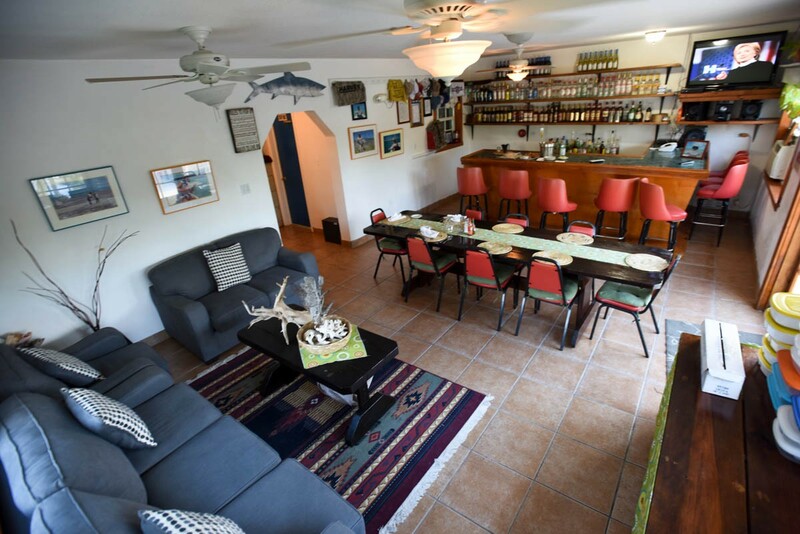 Outfitted with comfortable couches and plenty of fishing-related reading material, it boasts a fully stocked bar, perfect for mixing up a few celebratory cocktails while you tie more flies for tomorrow’s fishing. Prefer to keep up with your favorite sports teams? There’s also a satellite TV above the bar. Need to keep up on emails or just let family back home know how great your vacation is? Well, we’ve got you covered with free secure WiFi. Average Temps: Summer – 21°C to 34°C (70°F to 93°F); Winter – 15°C to 24°C (60°F to 75°F). Rainy Season: May-June & Sept-Oct. The Bahamas’ best bonefishing lodge located Cargill Creek, Andros Island, an area known in the bonefishing world as the “land of giants”. 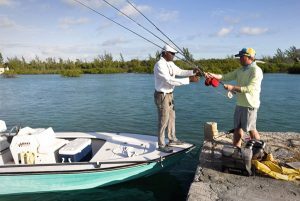 Although it’s the largest of the Bahamian Islands, Andros is off the beaten path for tourists, but not for serious in-the-know fly fisherman. The flats and cays in the North Bight were once bonefishing’s best kept secret. Lodges like the Bang Bang Club and guides like “Crazy” Charlie Smith drew jet-set CEOs and sportsmen from around the world looking to land a trophy bonefish on a flyrod. 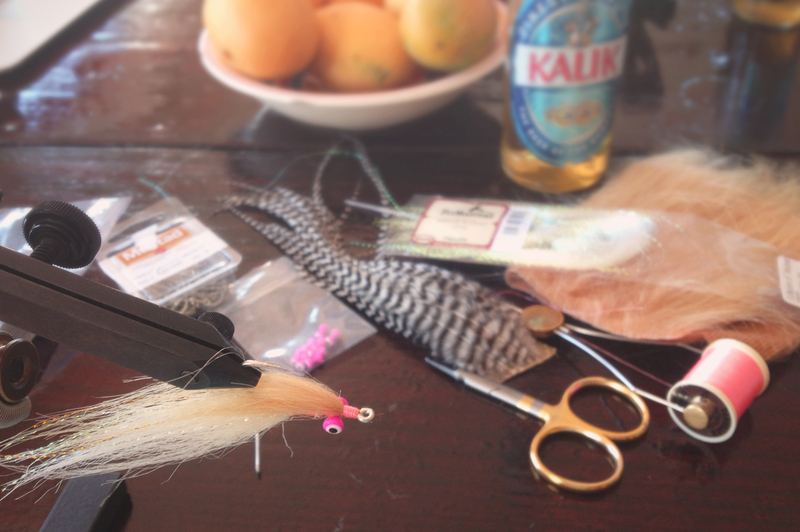 With the growing popularity of bonefishing, Charlie and Fatiha Neymour chose to create their own intimate sportfishing lodge catering to anglers of all experience levels. 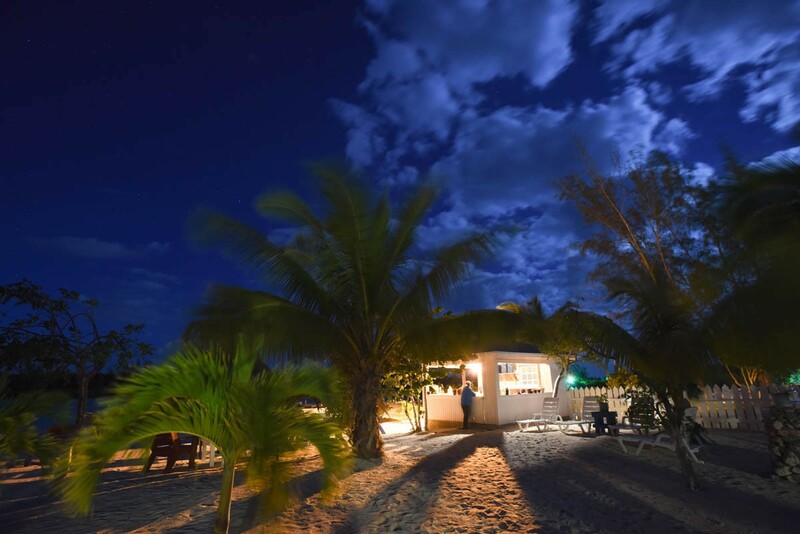 A 100% Bahamian owned and operated lodge, we now host cosmopolitan guests from around the world who come not only to fish, but relax and enjoy Andros’ unique beauty and rich fishing culture. Located on Cargill Creek (basically Andros guide neighborhood), we are strategically located close to the bonefishing flats of Andros’ North Bight. This means a much shorter run to and from the flats (especially on bad weather days) and more time spent fishing… which we think is a good thing! We are known for our food! We offer the best classic Bahamian dishes—fried fish, grilled lobster & cracked conch—but we also we cater to the international traveler’s taste with a variety of dishes from around the world. One of our specialties comes from the Mediterranean, authentic Morocco cuisine prepared by our very own Fatiha; for her it is home cooking! Breakfast is usually custom-made to your taste—coffee or tea, bacon & eggs, oatmeal, grits, cereal, fresh fruit—although don’t be surprised to find the occasional exotic treat like half a lobster tail next to your scrambled eggs! Appetizers will be waiting for you when you return from a day on the water. 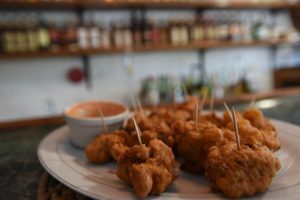 Sample some tasty treats including famous Bahamian Conch Fritters, Conch Salad or Grouper Fingers. 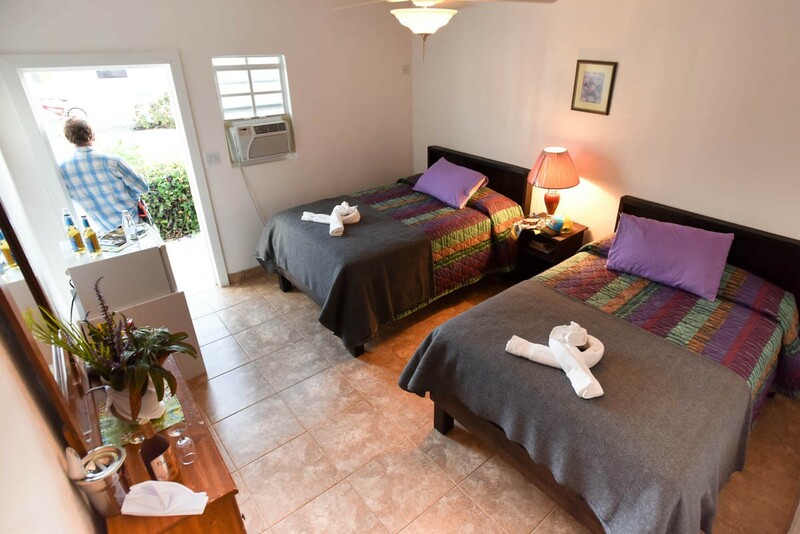 Our rates include all food and drink, even alcoholic beverages! That’s good news, since the beer is always cold at our well stocked bar. 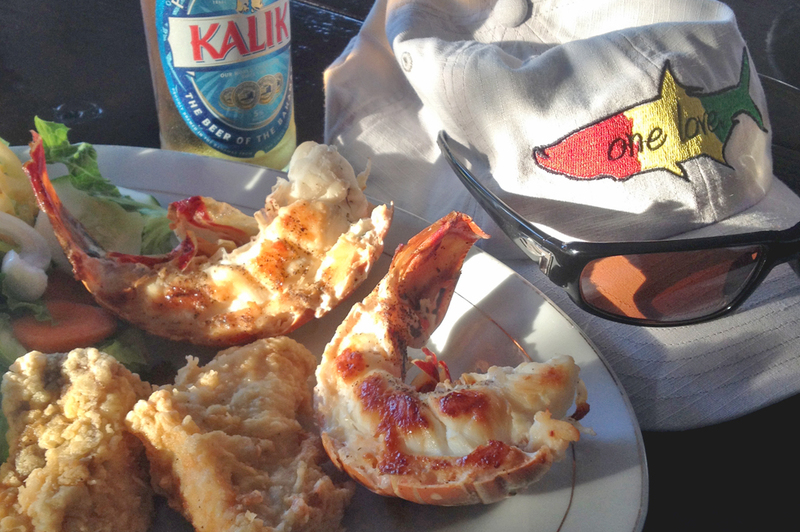 Or, let us introduce to you the Bahamian tropical experience with a Bahama Mama, Creek Runner, Bonefish Special, Northern Bight Special, and (of course) the Crazy Charlie. Not in the mood for something sweet, no worries, we’ve got you covered with a selection of top shelf liquors, whatever your taste. BOOK YOUR BAHAMIAN BONEFISH ADVENTURE TODAY!